I'm making progress on the cottage painting. 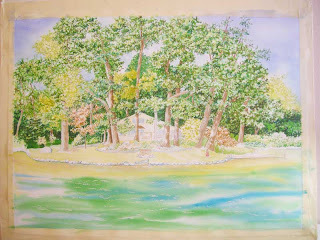 My foundational washes are all in and I have begun to add the texture and values to the trees. The reference photos were wonderful and sunny, so I am able to incorporate a lot of color which will add warmth and interest to this big landscape painting. I'm totally enjoying this painting as I am working in my comfort zone. It's like curling up with my favorite blanket and book on a cool afternoon. I'm loving it already. I want to go there.